Author Shahryar Sadree says he spent most of his life seeking happiness unsuccessfully, that is until he realized people are conditioned to think about things in an unnatural way. 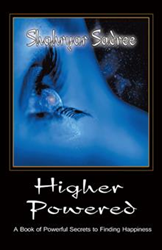 In “Higher Powered: A Book of Powerful Secrets to Finding Happiness” (published by Archway Publishing), Sadree shares his insights on how to understand behavior patterns and find the key to fulfillment in life. The author cites a major component to emotional distress is the culture of fear; Sadree notes most material trending in the news is fear. He asserts hatred, bigotry, racism, violence, intolerance and injustice is deeply-rooted in fear, and this restricts the flow of contentment. Sadree offers readers lessons to overcome fear and find happiness. Shahryar Sadree is an international artist and musician on a spiritual journey. After battling addiction and its aftermath for 35 years, he began to turn his life around and write about his discoveries. This book is the result of that change. He lives in Florida with his wife, Angie, and their many rescue animals. More information is available at higherpoweredbook.com/.